With a spy-master’s toolkit to keep in your pocket, you’re always prepared for adventure! Whether you spot a suspect and follow his trail, or see something fishy going on and want to slip undercover, you’ll find the tricks and gadgets you need in here! There’s an ID card to flash when you’re challenged, and a fingerprint card and magnifying glasses to help you collect evidence. 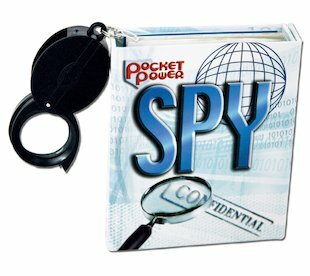 Plus a little booklet of smart spying tricks to get you on the case, and some stickers just for fun. Slip it in your pocket and snoop away! Magnetic-closure file contains a 32-page booklet, stickers, an ID card, fingerprint card, notepaper and magnifying glasses. I really want this book and I got it. The booklet is really good, tells lots of spy things like invisible ink and stuff and you can make stuff. The ID card is cool and stickers are wicked. The note paper is good. The keyring is sick and cool. You could see everything,coz it was a magnifying glass.